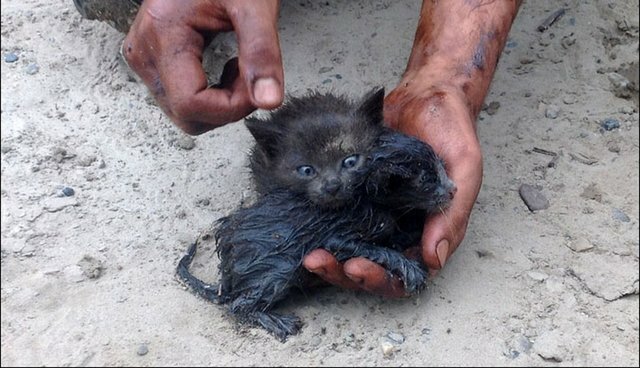 Oil spills can be devastating for any little critters who happen to get caught in them, and these two kittens were no different. They were the victims of a ruptured oil pipeline in Nefteyugansk, Russia, last month, caught up in oily floodwater. Local resident Anatoly Tuptey heard their cries and saw them drowning, struggling to stay afloat. "My soul could not stand the cries, I went to see," Tuptey told the Siberian Times. The kittens were clinging to a board in a flooded house. "One was up to its neck in the oil," Tuptey said. Tuptey charged into the murky water and scooped up the struggling kittens. He wrapped them in his t-shirt to help dry them off and warm them up before taking the kittens back to his home, where he bathed them, fed them and introduced them to his dog. Tuptey, an animal lover, couldn't imagine how anyone could leave pets behind in empty, flooded homes. The oil pipeline that caused the spill is owned by Rosneft Energy, the Siberian Times reports. After oil spills, volunteer rescuers are often charged with helping the hundreds, sometimes thousands of animals affected. These two little kittens are safe now, but it's easy to imagine their fate if Tuptey hadn't heard their desperate cries. Thankfully he was nearby, and now they're safe, oil-free and back to being carefree kittens. Oil spills affect animals all over the world - to find out how you can help click here.